Local businesses as well as nonprofit organizations and cultural institutions can raise their profile within the community by participating in Jazz April. Even if your business or organization is not primarily jazz-related, letting jazz-loving customers, clients, visitors and members know that you share their interest in this exciting, energizing, enlightening and enriching art form will build goodwill and interest in all your activities. Whatever you do, let us know! Send reports (including links), photos and videos of your JazzApril activities to jazzapril@jazzjournalists.org -- we may feature you on our Facebook page. 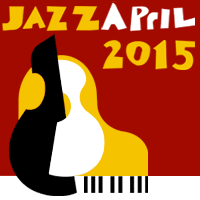 Put up a sign or banner during the month of April that announces that it's "JazzApril" or says "April is Jazz Month. "There's no official design required, but you can include the Jazz April/Jazz Appreciation Month/International Jazz Day logos if you like, downloadable here. Include JazzApril slogans and logos in your April promotion and advertising materials, online and print. A link to this site, the Smithsonian Jazz Appreciation Month and/or UNESCO International Jazz Day sites is good, too. Consider promoting your JazzApril involvement with an ad in a local publication, in print or online, that is publishing special jazz coverage in April. Or suggest that a publication you regularly advertise in produce such coverage. Why not a package of articles, or a section? Feature jazz-related or music-listening products, if you carry them, in advertising and in-house displays. Highlight them on your website. Offer a discount during April to members of local jazz organizations or societies. Be sure to let the group(s) know sufficiently in advance so they can notify their members. And while you're at it, join their organization or society. They will be oh, so grateful. Have a special code word --"JazzApril"?-- that anyone can use for a discount during April. Play jazz music during April (radio or your own sources) in your store or place of business. Help local jazz musicians and organizations promote their JazzApril events/performances, perhaps by including a mention in your own ads or by putting up their posters. And, of course, if your business can accomodate live musicians, book them! See below. Invite a jazz journalist -- writer, broadcaster or other knowledgeable, articulate person -- to talk about jazz, conduct a listening session or interview a local musician live on your premises. The JJA can help you find someone: email us at jazzapril@jazzjournalists.org. Invite a local photographer or artist to exhibit some jazz-related photos or artwork on your premises during April. Invite them to put a jazz photo slideshow on your website. Include one or more of the hashtags #jazzapril #jazzday #celebrateJAM when you tweet about your JazzApril activities or promotions. Post about them on your Facebook page. Install the JazzApril "ribbon" on your business and personal Twitter and Facebook avatars. Some communities will be holding small parties to honor local "Jazz Heroes" during April. If your community is one, please support the party and honor your local Hero. If you have a business that sells food or drink, create a JazzApril food or drink special and name it after a well-known or locally-beloved jazz musician. Announce this on your Facebook page and in other social media. Contribute, financially or in-kind, to local "Jazz Heroes" or "Jazz Day" celebrations, or make a donation to local non-profit organizations producing their own JazzApril initiatives. Your sponsorship will give you additional name-recognition among local jazz audiences. If you have contacts with local officials or belong to a Chamber of Commerce or other business organization, mention your participation in JazzApril and encourage others to participate and to support jazz-related activities as beneficial to the community and to local business development. It's not too late to set up an April jazz performance featuring local musicians if one isn't already scheduled. It doesn't need to be on Jazz Day (April 30) Any April date, day or night, is good. During performances, make sure MCs and musicians talk about JazzApril, announce the hashtags #jazzapril #jazzday #celebrateJAM and encourage audience members to Tweet about the performances, including the venue name and city. Tweets that include any of these hashtags will appear on the JAM and JazzDay feeds, providing publicity for you as well as them. Register any events scheduled for April 30, International Jazz Day, at the IJD site. Any publicity or advertising -- print or online -- for April jazz performances can include JazzApril, Jazz Appreciation Month/International Jazz Day logos or simply the slogan "JazzApril" or "April is Jazz Month." A link to this site or the Smithsonian Jazz Appreciation Month and/or UNESCO International Jazz Day sites is good, too. Urge local jazz journalists to cover your event. Even if they've been unable to do so in the past, they may be in a position to do coverage in conjunction with the larger JAM and IJD context as a "story peg." The Jazz Journalists Association is working with our 300+ members to themselves propose and produce more jazz writing, more photography, more broadcasting during JazzApril. Ask local jazz radio/webcast hosts if they will interview musicians appearing in your venue. Many broadcasters will do special JazzApril programs, and are looking now for guests. Offer a pair or two of free concert or event tickets to local radio/webcasters for an on-air ticket giveaway. Announce this on your Facebook page and in other social media. If a local Jazz Hero is being honored in your community during April, mention him or her during every event and performance. 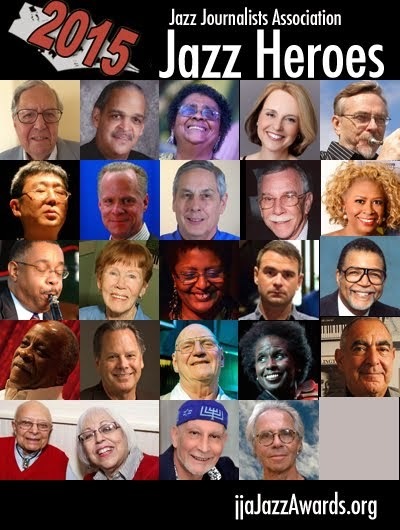 The Jazz Journalists Association coordinates the Jazz Heroes Awards and can inform you if one is being honored near you. Email us at jazzapril@jazzjournalists.org.